The Madoff investment scandal was a major case of stock and securities fraud discovered in late 2008. In December of that year, Bernard Madoff, the former NASDAQ Chairman and founder of the Wall Street firm Bernard L. Madoff Investment Securities LLC, admitted that the wealth management arm of his business was an elaborate Ponzi scheme. Madoff founded the Wall Street firm Bernard L. Madoff Investment Securities LLC in 1960, and was its chairman until his arrest. The firm employed Madoff's brother Peter as senior managing director and chief compliance officer, Peter's daughter Shana Madoff as rules and compliance officer and attorney, and Madoff's sons Andrew and Mark. Peter has since been sentenced to 10 years in prison, and Mark committed suicide by hanging exactly two years after his father's arrest. Alerted by his sons, federal authorities arrested Madoff on December 11, 2008. On March 12, 2009, Madoff pleaded guilty to 11 federal crimes and admitted to operating the largest private Ponzi scheme in history. On June 29, 2009, he was sentenced to 150 years in prison with restitution of $170 billion. According to the original federal charges, Madoff said that his firm had "liabilities of approximately US$50 billion". Prosecutors estimated the size of the fraud to be $64.8 billion, based on the amounts in the accounts of Madoff's 4,800 clients as of November 30, 2008. Ignoring opportunity costs and taxes paid on fictitious profits, half of Madoff's direct investors lost no money, with Madoff's repeated (and repeatedly ignored) whistleblower, Harry Markopolos, estimating that at least $35 billion of the money Madoff claimed to have stolen never really existed, but was simply fictional profits he reported to his clients. Investigators have determined others were involved in the scheme. The U.S. Securities and Exchange Commission (SEC) has also been criticized for not investigating Madoff more thoroughly. Questions about his firm had been raised as early as 1999. Madoff's business was one of the top market makers on Wall Street and in 2008 was the sixth-largest. Madoff's personal and business asset freeze created a chain reaction throughout the world's business and philanthropic community, forcing many organizations to at least temporarily close, including the Robert I. Lappin Charitable Foundation, the Picower Foundation, and the JEHT Foundation. Madoff started his firm in 1960 as a penny stock trader with $5,000, earned from working as a lifeguard and sprinkler installer. His fledgling business began to grow with the assistance of his father-in-law, accountant Saul Alpern, who referred a circle of friends and their families. Initially, the firm made markets (quoted bid and ask prices) via the National Quotation Bureau's Pink Sheets. To compete with firms that were members of the New York Stock Exchange trading on the stock exchange's floor, his firm began using innovative computer information technology to disseminate quotes. After a trial run, the technology that the firm helped develop became the NASDAQ. At one point, Madoff Securities was the largest buying-and-selling "market maker" at the NASDAQ. ... one of the masters of the off-exchange "third market" and the bane of the New York Stock Exchange. He has built a highly profitable securities firm, Bernard L. Madoff Investment Securities, which siphons a huge volume of stock trades away from the Big Board. The $740 million average daily volume of trades executed electronically by the Madoff firm off the exchange equals 9% of the New York exchange's. Mr. Madoff's firm can execute trades so quickly and cheaply that it actually pays other brokerage firms a penny a share to execute their customers' orders, profiting from the spread between bid and asked prices that most stocks trade for. Several family members worked for him. His younger brother, Peter, was senior managing director and chief compliance officer, and Peter's daughter, Shana Madoff, was the compliance attorney. Madoff's sons, Mark and Andrew, worked in the trading section, along with Charles Weiner, Madoff's nephew. Andrew Madoff had invested his own money in his father's fund, but Mark stopped in about 2001. Federal investigators believe the fraud in the investment management division and advisory division may have begun in the 1970s. However, Madoff himself stated his fraudulent activities began in the 1990s. In the 1980s, Madoff's market-maker division traded up to 5% of the total volume made on the New York Stock Exchange. Madoff was "the first prominent practitioner" of payment for order flow, paying brokers to execute their clients' orders through his brokerage, a practice some have called a "legal kickback". This practice gave Madoff the distinction of being the largest dealer in NYSE-listed stocks in the U.S., trading about 15% of transaction volume. Academics have questioned the ethics of these payments. Madoff has argued that these payments did not alter the price that the customer received. He viewed payments for order flow as a normal business practice: "If your girlfriend goes to buy stockings at a supermarket, the racks that display those stockings are usually paid for by the company that manufactured the stockings. Order flow is an issue that attracted a lot of attention but is grossly overrated." By 2000, Madoff Securities, one of the top traders of US securities, held approximately $300 million in assets. The business occupied three floors of the Lipstick Building, with the investment management division, referred to as the "hedge fund", employing a staff of approximately 24. Madoff ran a branch office in London that employed 28 people, separate from Madoff Securities. The company handled investments for his family of approximately £80 million. Two remote cameras installed in the London office permitted Madoff to monitor events from New York. In 1992, Bernard Madoff explained his purported strategy to The Wall Street Journal. He said the returns were really nothing special, given that the Standard & Poors 500-stock index generated an average annual return of 16.3% between November 1982 and November 1992. "I would be surprised if anybody thought that matching the S&P over 10 years was anything outstanding." The majority of money managers actually trailed the S&P 500 during the 1980s. The Journal concluded Madoff's use of futures and options helped cushion the returns against the market's ups and downs. Madoff said he made up for the cost of the hedges, which could have caused him to trail the stock market's returns, with stock-picking and market timing. 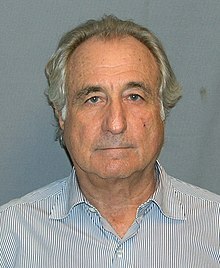 Madoff's sales pitch was an investment strategy consisting of purchasing blue-chip stocks and taking options contracts on them, sometimes called a split-strike conversion or a collar. "Typically, a position will consist of the ownership of 30–35 S&P 100 stocks, most correlated to that index, the sale of out-of-the-money 'calls' on the index and the purchase of out-of-the-money 'puts' on the index. The sale of the 'calls' is designed to increase the rate of return, while allowing upward movement of the stock portfolio to the strike price of the 'calls'. The 'puts', funded in large part by the sales of the 'calls', limit the portfolio's downside." In his 1992 "Avellino and Bienes" interview with The Wall Street Journal, Madoff discussed his supposed methods: In the 1970s, he had placed invested funds in "convertible arbitrage positions in large-cap stocks, with promised investment returns of 18% to 20%", and in 1982, he began using futures contracts on the stock index, and then placed put options on futures during the 1987 stock market crash. A few analysts performing due diligence had been unable to replicate the Madoff fund's past returns using historic price data for U.S. stocks and options on the indexes. Barron's raised the possibility that Madoff's returns were most likely due to front running his firm's brokerage clients. Mitchell Zuckoff, professor of journalism at Boston University and author of Ponzi's Scheme: The True Story of a Financial Legend, says that "the 5% payout rule", a federal law requiring private foundations to pay out 5% of their funds each year, allowed Madoff's Ponzi scheme to go undetected for a long period since he managed money mainly for charities. Zuckoff notes, "For every $1 billion in foundation investment, Madoff was effectively on the hook for about $50 million in withdrawals a year. If he was not making real investments, at that rate the principal would last 20 years. By targeting charities, Madoff could avoid the threat of sudden or unexpected withdrawals. In his guilty plea, Madoff admitted that he hadn't actually traded since the early 1990s, and all of his returns since then had been fabricated. However, David Sheehan, principal investigator for Picard, believes the wealth management arm of Madoff's business had been a fraud from the start. Madoff's operation differed from a typical Ponzi scheme. While most Ponzis are based on nonexistent businesses, Madoff's brokerage operation was very real. Rather than offer high returns to all comers, Madoff offered modest but steady returns to an exclusive clientele. The investment method was marketed as "too complicated for outsiders to understand". He was secretive about the firm's business, and kept his financial statements closely guarded. The New York Post reported that Madoff "worked the so-called 'Jewish circuit' of well-heeled Jews he met at country clubs on Long Island and in Palm Beach". (The scandal so affected Palm Beach that, according to The Globe and Mail, residents "stopped talking about the local destruction the Madoff storm caused only when Hurricane Trump came along" in 2016.) The New York Times reported that Madoff courted many prominent Jewish executives and organizations; according to the Associated Press, they "trusted [Madoff] because he is Jewish". One of the most prominent promoters was J. Ezra Merkin, whose fund Ascot Partners steered $1.8 billion towards Madoff's firm. A scheme that targets members of a particular religious or ethnic community is a type of affinity fraud, and a Newsweek article identified Madoff's scheme as "an affinity Ponzi". Madoff was a "master marketer", and his fund was considered exclusive, giving the appearance of a "velvet rope". He generally refused to meet directly with investors, which gave him an "Oz" aura and increased the allure of the investment. Some Madoff investors were wary of removing their money from his fund, in case they could not get back in later. The Swiss bank Union Bancaire Privée explained that because of Madoff's huge volume as a broker-dealer, the bank believed he had a perceived edge on the market because his trades were timed well, suggesting they believed he was front running. The Madoff family gained unusual access to Washington's lawmakers and regulators through the industry's top trade group. The Madoff family has long-standing, high-level ties to the Securities Industry and Financial Markets Association (SIFMA), the primary securities industry organization. Bernard Madoff sat on the board of directors of the Securities Industry Association, which merged with the Bond Market Association in 2006 to form SIFMA. Madoff's brother Peter then served two terms as a member of SIFMA's board of directors. Peter's resignation as the scandal broke in December 2008 came amid growing criticism of the Madoff firm's links to Washington, and how those relationships may have contributed to the Madoff fraud. Over the years 2000–08, the two Madoff brothers gave $56,000 to SIFMA, and tens of thousands of dollars more to sponsor SIFMA industry meetings. In addition, Bernard Madoff's niece Shana Madoff was active on the Executive Committee of SIFMA's Compliance & Legal Division, but resigned her SIFMA position shortly after her uncle's arrest. She married former assistant director of the SEC's OCIE Eric Swanson, whom she had met in 2003 while he was investigating her uncle Bernie Madoff and his firm. The investigation concluded in 2005. In 2006 Swanson left the SEC and became engaged to Shana Madoff, and in 2007 the two married. A spokesman for Swanson said he "did not participate in any inquiry of Bernard Madoff Securities or its affiliates while involved in a relationship" with Shana Madoff. Madoff Securities LLC was investigated at least eight times over a 16-year period by the U.S. Securities and Exchange Commission (SEC) and other regulatory authorities. In 1992, the SEC investigated one of Madoff's feeder funds, Avellino & Bienes, the principals being Frank Avellino, Michael Bienes and his wife Dianne Bienes. Bienes began his career working as an accountant for Madoff's father-in-law, Saul Alpern. Then, he became a partner in the accounting firm Alpern, Avellino and Bienes. In 1962, the firm began advising its clients about investing all of their money with a mystery man, a highly successful and controversial figure on Wall Street—but until this episode, not known as an ace money manager—Madoff. When Alpern retired at the end of 1974, the firm became Avellino and Bienes and continued to invest solely with Madoff. Avellino & Bienes, represented by Ira Sorkin, Madoff's former attorney, were accused of selling unregistered securities. In a report to the SEC they mentioned the fund's "curiously steady" yearly returns to investors of 13.5% to 20%. However, the SEC did not look any more deeply into the matter, and never publicly referred to Madoff. Through Sorkin, who once oversaw the SEC's New York office, Avellino & Bienes agreed to return the money to investors, shut down their firm, undergo an audit, and pay a fine of $350,000. Avellino complained to the presiding Federal Judge, John E. Sprizzo, that Price Waterhouse fees were excessive, but the judge ordered him to pay the bill of $428,679 in full. Madoff said that he did not realize the feeder fund was operating illegally, and that his own investment returns tracked the previous 10 years of the S&P 500. The SEC investigation came right in the middle of Madoff's three terms as the chairman of the NASDAQ stock market board. The size of the pools mushroomed by word-of-mouth, and investors grew to 3,200 in nine accounts with Madoff. Regulators feared it all might be just a huge scam. "We went into this thinking it could be a major catastrophe. They took in nearly a half a billion dollars in investor money, totally outside the system that we can monitor and regulate. That's pretty frightening," said Richard Walker, who at the time was the SEC's New York regional administrator. Avellino and Bienes deposited $454 million of investors' money with Madoff, and until 2007, Bienes continued to invest several million dollars of his own money with Madoff. In a 2009 interview after the scam had been exposed, he said, "Doubt Bernie Madoff? Doubt Bernie? No. You doubt God. You can doubt God, but you don't doubt Bernie. He had that aura about him." The SEC investigated Madoff in 1999 and 2000 about concerns that the firm was hiding its customers' orders from other traders, for which Madoff then took corrective measures. In 2001, an SEC official met with Harry Markopolos at their Boston regional office and reviewed his allegations of Madoff's fraudulent practices. The SEC claimed it conducted two other inquiries into Madoff in the last several years, but did not find any violations or major issues of concern. In 2004, after published articles appeared accusing the firm of front running, the SEC's Washington office cleared Madoff. The SEC detailed that inspectors had examined Madoff's brokerage operation in 2005, checking for three kinds of violations: the strategy he used for customer accounts; the requirement of brokers to obtain the best possible price for customer orders; and operating as an unregistered investment adviser. Madoff was registered as a broker-dealer, but doing business as an asset manager. "The staff found no evidence of fraud". In September 2005 Madoff agreed to register his business, but the SEC kept its findings confidential. During the 2005 investigation, Meaghan Cheung, a branch head of the SEC's New York's Enforcement Division, was the person responsible for the oversight and blunder, according to Harry Markopolos, who testified on February 4, 2009, at a hearing held by a House Financial Services Subcommittee on Capital Markets. In 2007, SEC enforcement completed an investigation they had begun on January 6, 2006 into a Ponzi scheme allegation. This investigation resulted in neither a finding of fraud, nor a referral to the SEC Commissioners for legal action. In 2007, the Financial Industry Regulatory Authority (FINRA), the industry-run watchdog for brokerage firms, reported without explanation that parts of Madoff's firm had no customers. "At this point in time we are uncertain of the basis for FINRA's conclusion in this regard," SEC staff wrote shortly after Madoff was arrested. As a result, the chairman of the SEC, Christopher Cox, stated that an investigation will delve into "all staff contact and relationships with the Madoff family and firm, and their impact, if any, on decisions by staff regarding the firm". A former SEC compliance officer, Eric Swanson, married Madoff's niece Shana, a Madoff firm compliance attorney. Outside analysts raised concerns about Madoff's firm for years. Thorp complained in 1991. The second case of concerns about Madoff's operation was raised in May 2000, when Harry Markopolos, a financial analyst and portfolio manager at Boston options trader Rampart Investment Management, alerted the SEC about his suspicions. A year earlier, Rampart had found out that Access International Advisors, one of its trading partners, had significant investments with Madoff. Markopolos' bosses at Rampart asked him to design a product that could replicate Madoff's returns. However, Markopolos concluded almost immediately that Madoff's numbers didn't add up. After four hours of trying and failing to replicate Madoff's returns, Markopolos concluded Madoff was a fraud. He told the SEC that based on his analysis of Madoff's returns, it was mathematically impossible for Madoff to deliver them using the strategies he claimed to use. In his view, there were only two ways to explain the figures—either Madoff was front running his order flow, or his wealth management business was a massive Ponzi scheme. This submission, along with three others, passed with no substantive action from the SEC. At the time of Markopolos' initial submission, Madoff managed assets from between $3 billion and $6 billion, which would have made his wealth management business the largest hedge fund in the world even then. The culmination of Markopolos' analysis was his third submission, a detailed 17-page memo entitled The World's Largest Hedge Fund is a Fraud. He had also approached The Wall Street Journal about the existence of the Ponzi scheme in 2005, but its editors decided not to pursue the story. The memo specified 30 numbered red flags based on 174 months (a little over 14 years) of Madoff trades. The biggest red flag was that Madoff reported only seven losing months during this time, and those losses were statistically insignificant. This produced a return stream that rose steadily upward at a nearly-perfect 45-degree angle. Markopolos argued that the markets were far too volatile even under the best of conditions for this to be possible, a fact that would have been clear to anyone who understood the underlying math. Later, Markopolos testified before Congress that this was like a baseball player batting .966 for the season "and no one suspecting a cheat". In part, the memo concluded: "Bernie Madoff is running the world's largest unregistered hedge fund. He's organized this business as a 'hedge fund of funds' privately labeling their own hedge funds which Bernie Madoff secretly runs for them using a split-strike conversion strategy getting paid only trading commissions which are not disclosed. If this is not a regulatory dodge, I do not know what is." Markopolos declared that Madoff's "unsophisticated portfolio management" was either a Ponzi scheme or front running (buying stock for his own account based on knowledge of his clients' orders), and concluded it was most likely a Ponzi scheme. In 2001, financial journalist Erin Arvedlund wrote an article for Barron's entitled "Don't Ask, Don't Tell", questioning Madoff's secrecy and wondering how he obtained such consistent returns. She reported that "Madoff's investors rave about his performance – even though they don't understand how he does it. 'Even knowledgeable people can't really tell you what he's doing,' one very satisfied investor told Barron's." The Barron's article and one in MarHedge by Michael Ocrant suggested Madoff was front-running to achieve his gains. Hedge funds investing with him were not permitted to name him as money manager in their marketing prospectus. When high-volume investors who were considering participation wanted to review Madoff's records for purposes of due diligence, he refused, convincing them of his desire that proprietary strategies remain confidential. By selling its holdings for cash at the end of each period, Madoff avoided filing disclosures of its holdings with the SEC, an unusual tactic. Madoff rejected any call for an outside audit "for reasons of secrecy", claiming that was the exclusive responsibility of his brother, Peter, the company's chief compliance officer". Markopolos later testified to Congress that to deliver 12% annual returns to the investor, Madoff needed to earn 16% gross, so as to distribute a 4% fee to the feeder fund managers, who Madoff needed to secure new victims, with the 4% ensuring these feeder fund managers would stay "willfully blind, and not get too intrusive". Concerns were also raised that Madoff's auditor of record was Friehling & Horowitz, a two-person accounting firm based in suburban Rockland County that had only one active accountant, David G. Friehling, a close Madoff family friend. Friehling was also an investor in Madoff's fund, which was seen as a blatant conflict of interest. In 2007, hedge fund consultant Aksia LLC advised its clients not to invest with Madoff, saying it was inconceivable that a tiny firm could adequately service such a massive operation. Typically, hedge funds hold their portfolio at a securities firm (a major bank or brokerage), which acts as the fund's prime broker. This arrangement allows outside investigators to verify the holdings. Madoff's firm was its own broker-dealer and allegedly processed all of its trades. Ironically, Madoff, a pioneer in electronic trading, refused to provide his clients online access to their accounts. He sent out account statements by mail, unlike most hedge funds, which email statements. Madoff operated as a broker-dealer who also ran an asset management division. In 2003, Joe Aaron, a hedge-fund professional, also found the structure suspicious and warned a colleague to avoid investing in the fund, "Why would a good businessman work his magic for pennies on the dollar?" he concluded. Also in 2003, Renaissance Technologies, "arguably the most successful hedge fund in the world", reduced its exposure to Madoff's fund first by 50 percent and eventually completely because of suspicions about the consistency of returns, the fact that Madoff charged very little compared to other hedge funds and the impossibility of the strategy Madoff claimed to use because options volume had no relation to the amount of money Madoff was said to administer. The options volume implied that Madoff's fund had $750 million, while he was believed to be managing $15 billion. And only if Madoff was assumed to be responsible for all the options traded in the most liquid strike price. Charles J. Gradante, co-founder of hedge-fund research firm Hennessee Group, observed that Madoff "only had five down months since 1996", and commented on Madoff's investment performance: "You can't go 10 or 15 years with only three or four down months. It's just impossible." In 2001, Michael Ocrant, editor-in-chief of MARHedge wrote a story in which he interviewed traders who were incredulous that Madoff had 72 consecutive gaining months, an unlikely possibility. Clients such as Fairfield Greenwich Group and Union Bancaire Privée claimed that they had been given an "unusual degree of access" to evaluate and analyze Madoff's funds and found nothing unusual with his investment portfolio. The Central Bank of Ireland failed to spot Madoff's gigantic fraud when he started using Irish funds and had to supply large amounts of information that should have been enough to enable the Irish regulator to uncover the fraud much earlier than late 2008 when he was finally arrested in New York. The scheme began to unravel in the fall of 2008, when the general market downturn accelerated. Madoff had previously come close to collapse in the second half of 2005 after Bayou Group, a group of hedge funds, was exposed as a Ponzi scheme that used a bogus accounting firm to misrepresent its performance. By November, investors had requested $105 million in redemptions, though Madoff's Chase account only had $13 million. Madoff only survived by moving money from his broker-dealer's account into his Ponzi scheme account. Eventually, he drew on $342 million from his broker-dealer's credit lines to keep the Ponzi scheme afloat through 2006. Markopolos wrote that he suspected Madoff was on the brink of insolvency as early as June 2005, when his team learned he was seeking loans from banks. By then, at least two major banks were no longer willing to lend money to their customers to invest it with Madoff. In June 2008, Markopolos' team uncovered evidence that Madoff was accepting leveraged money. To Markopolos' mind, Madoff was running out of cash and needed to increase his promised returns to keep the scheme going. As it turned out, redemption requests from skittish investors ramped up in the wake of the collapse of Bear Stearns in March 2008. The trickle became a flood with when Lehman Brothers was forced into bankruptcy in September, as well as the near-collapse of American International Group at the same time. As the market's decline accelerated, investors tried to withdraw $7 billion from the firm. Unknown to them, however, Madoff had simply deposited his clients' money into his business account at Chase Manhattan Bank, and paid customers out of that account when they requested withdrawals. To pay off those investors, Madoff needed new money from other investors. However, in November, the balance in the account dropped to dangerously low levels. Only $300 million in new money had come in, but customers had withdrawn $320 million. He had just barely enough in the account to meet his redemption payroll on November 19. Even with a rush of new investors who believed Madoff was one of the few funds that was still doing well, it still wasn't enough to keep up with the avalanche of withdrawals. In the weeks prior to his arrest, Madoff struggled to keep the scheme afloat. In November 2008, Madoff Securities International (MSIL) in London made two fund transfers to Bernard Madoff Investment Securities of approximately $164 million. MSIL had neither customers nor clients, and there is no evidence that it conducted any trades on behalf of third parties. Madoff received $250 million around December 1, 2008, from Carl J. Shapiro, a 95-year-old Boston philanthropist and entrepreneur who was one of Madoff's oldest friends and biggest financial backers. On December 5, he accepted $10 million from Martin Rosenman, president of Rosenman Family LLC, who later sought to recover the never-invested $10 million, deposited in a Madoff account at JPMorgan, wired six days before Madoff's arrest. Judge Lifland ruled that Rosenman was "indistinguishable" from any other Madoff client, so there was no basis for giving him special treatment to recover funds. The judge separately declined to dismiss a lawsuit brought by Hadleigh Holdings, which claims it entrusted $1 million to the Madoff firm three days before his arrest. Madoff asked others for money in the final weeks before his arrest, including Wall Street financier Kenneth Langone, whose office was sent a 19-page pitch book, allegedly created by the staff at the Fairfield Greenwich Group. Madoff said he was raising money for a new investment vehicle, between $500 million and $1 billion for exclusive clients, was moving quickly on the venture, and wanted an answer by the following week. Langone declined. In November, Fairfield announced the creation of a new feeder fund. However, it was far too little and far too late. By the week after Thanksgiving, Madoff knew he was at the end of his tether. The Chase account, which at one point in 2008 had well over $5 billion, was down to only $234 million. With banks having all but stopped lending to anyone, he knew he could not even begin to borrow enough money to meet the outstanding redemption requests. On December 4, he told Frank DiPascali, who oversaw the Ponzi scheme's operation, that he was finished. He directed DiPascali to use the remaining balance in the Chase account to cash out the accounts of relatives and favored investors. On December 9, he told Peter that he was on the brink of collapse. The following morning, December 10, he suggested to his sons, Mark and Andrew, that the firm pay out over $170 million in bonuses two months ahead of schedule, from $200 million in assets that the firm still had. According to the complaint, Mark and Andrew, reportedly unaware of the firm's pending insolvency, confronted their father, asking him how the firm could pay bonuses to employees if it could not pay investors. At that point, Madoff asked his sons to follow him to his apartment, where he admitted that he was "finished", and that the asset management arm of the firm was in fact a Ponzi scheme – as he put it, "one big lie". Mark and Andrew then reported him to the authorities. Madoff intended to take a week to wind up the firm's operations before his sons alerted authorities. Instead, Mark and Andrew immediately called lawyers. When the sons revealed their father's plan to use the remaining money to pay relatives and favored investors, their lawyers put them in touch with federal prosecutors and the SEC. Madoff was arrested the following morning. Investigators were looking for others involved in the scheme, despite Madoff's assertion that he alone was responsible for the large-scale operation. Harry Susman, an attorney representing several clients of the firm, stated that "someone had to create the appearance that there were returns", and further suggested that there must have been a team buying and selling stocks, forging books, and filing reports. James Ratley, president of the Association of Certified Fraud Examiners said, "In order for him to have done this by himself, he would have had to have been at work night and day, no vacation and no time off. He would have had to nurture the Ponzi scheme daily. What happened when he was gone? Who handled it when somebody called in while he was on vacation and said, 'I need access to my money'?" "Simply from an administrative perspective, the act of putting together the various account statements, which did show trading activity, has to involve a number of people. You would need office and support personnel, people who actually knew what the market prices were for the securities that were being traded. You would need accountants so that the internal documents reconcile with the documents being sent to customers at least on a superficial basis," said Tom Dewey, a securities lawyer. Cohmad Securities Corp., of which Madoff owned a 10–20% stake: The brokerage firm lists its address as Madoff's firm's address in New York City. Its chairman, Maurice J. Cohn, his daughter and COO Marcia Beth Cohn, and Robert M. Jaffe, a broker at the firm, are accused by the SEC of 4 counts of civil fraud, "knowingly or recklessly disregarding facts indicating that Madoff was operating a fraud". Another lawsuit filed by bankruptcy trustee Irving Picard is seeking funds for Madoff victims. Jaffe has requested the Court dismiss the charges in both cases. Stanley Chais, of the Brighton Company: On May 1, 2009, Picard filed a lawsuit against Stanley Chais, 82. The complaint alleges he "knew or should have known" he was involved in a Ponzi scheme when his family investments with Madoff averaged 40% return. It also claims Chais was a primary beneficiary of the scheme for at least 30 years, allowing his family to withdraw more than $1 billion from their accounts since 1995. The SEC filed a similar civil suit mirroring these claims. On September 22, 2009 Chais was sued by California Attorney General Jerry Brown seeking $25 million in penalties as well as restitution for victims, saying the Beverly Hills investment manager was a 'middleman' in Madoff's Ponzi scheme. Madoff Securities International Ltd. in London. Carl J. Shapiro, women's clothing entrepreneur, self-made millionaire and philanthropist, and one of Madoff's oldest friends and biggest financial backers, who helped him start his investment firm in 1960: He was never in the finance business. In 1971, Mr. Shapiro sold his business, Kay Windsor, Inc. for $20 million. Investing most of it with Madoff, that sum grew to hundreds of millions of dollars and possibly to more than $1 billion. Shapiro personally lost about $400 million, $250 million of which he gave to Madoff 10 days before his arrest. His foundation lost more than $100 million. David G. Friehling, 49, the sole practitioner at Friehling & Horowitz CPAs, waived indictment and pleaded not guilty to criminal charges on July 10, 2009. He agreed to proceed without having the evidence in the criminal case against him reviewed by a grand jury at a hearing before U.S. District Judge Alvin Hellerstein in Manhattan. Friehling was charged on March 18, 2009, with securities fraud, aiding and abetting investment adviser fraud, and four counts of filing false audit reports with the SEC. On November 3, 2009, Friehling pled guilty to the charges. His involvement in the scheme made it the largest accounting fraud in history. Peter B. Madoff, 63, chief compliance officer, worked with his brother Bernie for more than 40 years, and ran the daily operations for the past 20 years. He helped create the computerized trading system. Ruth Madoff, Bernard's wife, agreed as part of his sentencing, to keep $2.5 million of her claim of more than $80 million in assets and to give up all of her possessions. The money is not protected from civil legal actions pursued by a court-appointed trustee liquidating Madoff's assets or by investor lawsuits. On July 29, 2009, she was sued by trustee Picard to recover $45 million in Madoff funds that were used to support her "life of splendor". According to court filings, she received more than $3 million from the business over the prior six years to pay personal expenses charged to her American Express card, and $2 million in payments to a business called PetCare RX. "Ruth Madoff was never an employee of BLMIS, yet millions of dollars belonging to BLMIS and its customers found their way into her personal accounts and investments without any legitimate business purpose or any value to BLMIS, simply because of her relationship with Bernard Madoff." She is also required to itemize any expenditures over $100. The case is Picard v. Madoff, 1:09-ap-1391, U.S. Bankruptcy Court, Southern District of New York (Manhattan). On November 25, 2008, she withdrew $5.5 million and $10 million on December 10, 2008, from her brokerage account at Cohmad, a feeder fund that had an office in Madoff's headquarters and was part-owned by him. In November, she also received $2 million from her husband's London office, Madoff Securities International Ltd. She has not been charged with any crime, and has not been questioned by prosecutors. She has been seen riding the N.Y.C. subway and did not attend her husband's sentencing. Madoff's sons, Mark and Andrew Madoff, worked in the trading arm in the New York office, but also raised money marketing the Madoff funds. Their assets were frozen on March 31, 2009. The two became estranged from their father and mother in the wake of the fraud, which some contended was a charade to protect their assets from litigation. On October 2, 2009 a civil lawsuit was filed against them by trustee Picard for a judgment in the aggregate amount of at least $198,743,299. Peter Madoff and daughter Shana are also defendants. On March 15, 2010, they filed a motion to dismiss. On December 11, 2010, the second anniversary of Madoff's arrest, Mark Madoff was found hanging from a ceiling pipe in the living room of his SoHo loft apartment. Andrew Madoff died September 3, 2014 from cancer. He was 48, and had reconciled with his mother prior to his death. Told that his father wanted to speak with him and explain what he had done, Andrew told Matt Lauer of the Today Show he wasn't interested. Frank DiPascali, 52, who referred to himself as "director of options trading" and as "chief financial officer" at Madoff Securities, pled guilty on August 11, 2009, to 10 counts: conspiracy, securities fraud, investment advisor fraud, mail fraud, wire fraud, perjury, income tax evasion, international money laundering, falsifying books and records of a broker-dealer and investment advisor. He agreed to "connect the dots" and to "name names", with sentencing originally scheduled for May 2010. Prosecutors sought more than $170 billion in forfeiture, the same amount sought from Madoff, which represents funds deposited by investors and later disbursed to other investors. The same day, a SEC civil complaint was filed against DiPascali. On May 7, 2015, while still awaiting sentencing, DiPascali died of lung cancer. Enrica Cotellessa-Pitz, controller of Bernard L. Madoff Investment Securities LLC, but not a licensed certified public accountant: Her signature is on checks from BLMIS to Cohmad Securities Corp. representing commission payments. She was the liaison between the SEC and BLMIS regarding the firm's financial statements. The SEC has removed the statements from its website. Fairfield Greenwich Group, based in Greenwich, Connecticut, had a "Fairfield Sentry" fund—one of many feeder funds that gave investors portals to Madoff. On April 1, 2009, the Commonwealth of Massachusetts filed a civil action charging Fairfield Greenwich with fraud and breaching its fiduciary duty to clients by failing to provide promised due diligence on its investments. The complaint seeks a fine and restitution to Massachusetts investors for losses and disgorgement of performance fees paid to Fairfield by those investors. It alleges that, in 2005, Mr. Madoff coached Fairfield staff about ways to answer questions from SEC attorneys who were looking into Harry Markopolos' complaint about Madoff's operations. The Secretary of State has no plans to settle the lawsuit, in spite of the fact that Fairfield Greenwich has offered to repay all Massachusetts investors, and is expected to force Fairfield to explain e-mails and other evidence he has uncovered that appear to show that company officials knew about potential problems with Madoff but failed to disclose them to clients. On May 18, 2009, the hedge fund was sued by trustee Picard, seeking a return of $3.2 billion during the period from 2002 to Madoff's arrest in December 2008. However, the money may already be in the hands of Fairfield's own clients, who are likely off-limits to Picard, since they weren't direct investors with Madoff. J. Ezra Merkin, a prominent investment advisor and philanthropist, has been sued for his role in running a "feeder fund" for Madoff. On April 6, 2009, New York Attorney General Andrew Cuomo filed civil fraud charges against J. Ezra Merkin alleging he "betrayed hundreds of investors" by moving $2.4 billion of clients' money to Bernard Madoff without their knowledge. The complaint states he lied about putting the money with Madoff, failed to disclose conflicts of interest, and collected over $470 million in fees for his three hedge funds, Ascot Partners LP with Ascot Fund Ltd., Gabriel Capital Corp. and Ariel Fund Ltd. He promised he would actively manage the money, but instead, he misguided investors about his Madoff investments in quarterly reports, in investor presentations, and in conversations with investors. "Merkin held himself out to investors as an investing guru...In reality, Merkin was but a master marketer." Jeffry Picower and his wife, Barbara, of Palm Beach, Florida, and Manhattan, had two dozen accounts. He was a lawyer, accountant, and investor who led buyouts of health-care and technology companies. Mr. Picower's foundation stated its investment portfolio with Madoff was valued at nearly $1 billion at one time. On October 25, 2009, Picower, 67 was found dead of a massive heart attack at the bottom of his Palm Beach swimming pool. The Hadon Organisation, a UK-based company involved in mergers and acquisitions: Between 2001 and 2008 The Hadon Organisation established very close ties with Madoff Securities International Ltd. in London. Tremont Group Holdings started its first Madoff-only fund in 1997. That group managed several funds marketed under the Re Select Broad Market Fund. Daniel Bonventre, former operations director for Bernard Madoff Investment Securities. Joann Crupi (Westfield, NJ) and Annette Bongiorno (Boca Raton, FL), both back office employees, were arrested in November 2010. "Authorities previously said Bongiorno was a staff supervisor and was responsible for answering questions from Madoff's clients about their purported investments. They allege she oversaw the fabrication of documents", according to the Associated Press. Jerome O'Hara and George Perez, long-time employees of Bernard L. Madoff Investment Securities LLC (BLMIS), were charged in an indictment in November 2010, and in a 33-count superseding indictment on October 1, 2012. The criminal case is U.S.A. v. Madoff, 1:08-mJ-02735. The SEC case is Securities and Exchange Commission v. Madoff, 1:08-cv- 10791, both U.S. District Court, Southern District of New York. The cases against Fairfield Greenwich Group et al. are consolidated as 09-118 in U.S. District Court for the Southern District of New York (Manhattan). While awaiting sentencing, Madoff met with the SEC's Inspector General, H. David Kotz, who was conducting an investigation into how regulators failed to detect the fraud despite numerous red flags. Because of concerns of improper conduct by Inspector General Kotz in the Madoff investigation, Inspector General David C. Williams of the U.S. Postal Service was brought in to conduct an independent outside review. The Williams Report questioned Kotz's work on the Madoff investigation, because Kotz was a "very good friend" with Markopolos. Investigators were not able to determine when Kotz and Markopolos became friends. A violation of the ethics rule took place if the friendship was concurrent with Kotz's investigation of Madoff. Former SEC Chairman Harvey Pitt estimated the actual net fraud to be between $10 and $17 billion, because it does not include the fictional returns credited to the Madoff's customer accounts. The original criminal complaint estimated that investors lost $50 billion through the scheme, though The Wall Street Journal reports "that figure includes the alleged false profits that Mr. Madoff's firm reported to its customers for decades. It is unclear exactly how much investors deposited into the firm." He was originally charged with a single count of securities fraud and faced up to 20 years in prison, and a fine of $5 million if convicted. Court papers indicate that Madoff's firm had about 4,800 investment client accounts as of November 30, 2008, and issued statements for that month reporting that client accounts held a total balance of about $65 billion, but actually "held only a small fraction" of that balance for clients. Madoff was arrested by the Federal Bureau of Investigation (FBI) on December 11, 2008, on a criminal charge of securities fraud. According to the criminal complaint, the previous day he had told his sons that his business was "a giant Ponzi scheme". They called a friend for advice, Martin Flumenbaum, a lawyer, who called federal prosecutors and the SEC on their behalf. FBI Agent Theodore Cacioppi made a house call. "We are here to find out if there is an innocent explanation," Cacioppi said quietly. The 70-year-old financier paused, then said: "There is no innocent explanation." He had "paid investors with money that was not there". Madoff was released on the same day of his arrest after posting $10 million bail. Madoff and his wife surrendered their passports, and he was subject to travel restrictions, a 7 p.m. curfew at his co-op, and electronic monitoring as a condition of bail. Although Madoff only had two co-signers for his $10 million bail, his wife and his brother Peter, rather than the four required, a judge allowed him free on bail but ordered him confined to his apartment. Madoff has reportedly received death threats that have been referred to the FBI, and the SEC referred to fears of "harm or flight" in its request for Madoff to be confined to his Upper East Side apartment. Cameras monitored his apartment's doors, its communication devices sent signals to the FBI, and his wife was required to pay for additional security. Apart from 'Bernard L. Madoff' and 'Bernard L. Madoff Investment Securities LLC ("BMIS")', the order to freeze all activities also forbade trading from the companies Madoff Securities International Ltd. ("Madoff International") and Madoff Ltd.
On January 5, 2009, prosecutors had requested that the Court revoke his bail, after Madoff and his wife allegedly violated the court-ordered asset freeze by mailing jewelry worth up to $1 million to relatives, including their sons and Madoff's brother. It was also noted that $173 million in signed checks had been found in Madoff's office desk after he had been arrested. His sons reported the mailings to prosecutors. Previously, Madoff was thought to be cooperating with prosecutors. The following week, Judge Ellis refused the government's request to revoke Madoff's bail, but required as a condition of bail that Madoff make an inventory of personal items and that his mail be searched. On March 10, 2009, the U.S. Attorney for the Southern District of New York filed an 11-count criminal information, or complaint, charging Madoff with 11 federal crimes: securities fraud, investment adviser fraud, mail fraud, wire fraud, three counts of money laundering, false statements, perjury, making false filings with the SEC, and theft from an employee benefit plan. The complaint stated that Madoff had defrauded his clients of almost $65 billion – thus spelling out the largest Ponzi scheme in history, as well as the largest investor fraud committed by a single person. Madoff pleaded guilty to three counts of money laundering. Prosecutors allege that he used the London Office, Madoff Securities International Ltd. to launder more than $250 million of client money by transferring client money from the investment-advisory business in New York to London and then back to the U.S. to support the U.S. trading operation of Bernard L. Madoff Investment Securities LLC. Madoff gave the appearance that he was trading in Europe for his clients. On March 12, 2009, Madoff appeared in court in a plea proceeding, and pleaded guilty to all charges. There was no plea agreement between the government and Madoff; he simply pleaded guilty and signed a waiver of indictment. The charges carried a maximum sentence of 150 years in prison, as well as mandatory restitution and fines up to twice the gross gain or loss derived from the offenses. If the government's estimate is correct, Madoff will have to pay $7.2 billion in restitution. A month earlier, Madoff settled the SEC's civil suit against him. He accepted a lifetime ban from the securities industry, and also agreed to pay an undisclosed fine. Photographers waiting outside the entrance to the apartment block where Bernard Madoff was under house arrest. In his pleading allocution, Madoff admitted to running a Ponzi scheme and expressed regret for his "criminal acts". He stated that he had begun his scheme some time in the early 1990s. He wished to satisfy his clients' expectations of high returns he had promised, even though it was during an economic recession. He admitted that he hadn't invested any of his clients' money since the inception of his scheme. Instead, he merely deposited the money into his business account at Chase Manhattan Bank. He admitted to false trading activities masked by foreign transfers and false SEC returns. When clients requested account withdrawals, he paid them from the Chase account, claiming the profits were the result of his own unique "split-strike conversion strategy". He said he had every intention of terminating the scheme, but it proved "difficult, and ultimately impossible" to extricate himself. He eventually reconciled himself to being exposed as a fraud. Only two of at least 25 victims who had requested to be heard at the hearing spoke in open court against accepting Madoff's plea of guilt. Judge Denny Chin accepted his guilty plea and remanded him to incarceration at the Manhattan Metropolitan Correctional Center until sentencing. Chin said that Madoff was now a substantial flight risk given his age, wealth and the possibility of spending the rest of his life in prison. Madoff's attorney, Ira Sorkin filed an appeal, to return him back to his "penthouse arrest", await sentencing, and to reinstate his bail conditions, declaring he would be more amenable to cooperate with the government's investigation, and prosecutors filed a notice in opposition. On March 20, 2009, the appellate court denied his request. On June 26, 2009, Chin ordered Madoff to forfeit $170 million in assets. His wife Ruth will relinquish her claim to $80 million worth of assets, leaving her with $2.5 million in cash. The settlement does not prevent the SEC and Picard to continue making claims against Mrs. Madoff's funds in the future. Madoff had earlier requested to shield $70 million in assets for Ruth, arguing that it was unconnected to the fraud scheme. Prosecutors recommended a prison sentence of 150 years, the maximum possible under federal sentencing guidelines. They informed Chin that Irving Picard, the trustee overseeing bankruptcy proceedings for the Madoff organization, had indicated that "Mr. Madoff has not provided meaningful cooperation or assistance." The Bureau of US Prisons had recommended 50 years, while defense lawyer Ira Sorkin had recommended 12 years, arguing that Madoff had confessed. The judge granted Madoff permission to wear his personal clothing at sentencing. On June 29, Judge Chin sentenced Madoff to 150 years in prison, as recommended by the prosecution. Chin said he had not received any mitigating letters from friends or family testifying to Madoff's good deeds, saying that "the absence of such support is telling." Commentators noted that this was in contrast to other high-profile white collar trials such as that of Andrew Fastow, Jeffrey Skilling, and Bernard Ebbers who were known for their philanthropy and/or cooperation to help victims; however Madoff's victims included several charities and foundations, and the only person that pleaded for mercy was defense lawyer Ira Sorkin. Chin called the fraud "unprecedented" and "staggering", and stated that the sentence would deter others from committing similar frauds. He stated, "Here the message must be sent that Mr. Madoff's crimes were extraordinarily evil." Many victims, some of whom had lost their life savings, applauded the sentence. Chin agreed with prosecutors' contention that the fraud began at some point in the 1980s. He also noted Madoff's crimes were "off the charts" since federal sentencing guidelines for fraud only go up to $400 million in losses; Madoff swindled his investors out of several times that. Prosecutors estimated that, at the very least, Madoff was responsible for a loss of $13 billion, more than 32 times the federal cap; the commonly quoted loss of $65 billion is more than 162 times the cap. Chin said "I have a sense Mr. Madoff has not done all that he could do or told all that he knows," noting that Madoff failed to identify accomplices, making it more difficult for prosecutors to build cases against others. Chin dismissed Sorkin's plea for leniency, stating that Madoff made substantial loans to family members and moved $15 million from the firm to his wife's account shortly before confessing. Picard also said that Madoff's failure to provide substantial assistance complicated efforts to locate assets. A former federal prosecutor suggested Madoff would have had the possibility of a sentence with parole if he fully cooperated with investigators, but Madoff's silence implied that there were other accomplices in the fraud, which led the judge to impose the maximum sentence. Chin also ordered Madoff to pay $17 billion in restitution. Madoff apologized to his victims at the sentencing, saying, "I have left a legacy of shame, as some of my victims have pointed out, to my family and my grandchildren. This is something I will live in for the rest of my life. I'm sorry. ... I know that doesn't help you." Madoff was incarcerated at Butner Federal Correctional Complex outside Raleigh, North Carolina. His inmate number is #61727-054. On July 28, 2009, he gave his first jailhouse interview to Joseph Cotchett and Nancy Fineman, attorneys from San Francisco, because they threatened to sue his wife, Ruth, on behalf of several investors who lost fortunes. During the 4​1⁄2 hour session, he "answered every one of [the attorneys'] questions", and expressed remorse, according to Cotchett. Madoff's combined assets were worth about $826 million at the time they were frozen. Madoff provided a confidential list of his and his firm's assets to the SEC on December 31, which was subsequently disclosed on March 13, 2009 in a court filing. Madoff had no IRAs, no 401(k), no Keogh plan, no other pension plan and no annuities. He owned less than a combined $200,000 in securities in Lehman Brothers, Morgan Stanley, Fidelity, Bear Stearns, and M&T. No offshore or Swiss bank accounts were listed. On March 17, 2009, a prosecutor filed a document listing more assets including $2.6 million in jewelry and about 35 sets of watches and cufflinks, more than $30 million in loans owed to the couple by their sons, and Ruth Madoff's interest in real estate funds sponsored by Sterling Equities, whose partners include Fred Wilpon. Ruth Madoff, and Peter Madoff, invested as "passive limited partners" in real estate funds sponsored by the company, as well as other venture investments. Assets also include the Madoffs' interest in Hoboken Radiology LLC. in Hoboken, New Jersey; Delivery Concepts LLC, an online food ordering service in midtown Manhattan that operates as "delivery.com"; an interest in Madoff La Brea LLC; an interest in the restaurant, PJ Clarke's on the Hudson LLC; and Boca Raton, Florida-based Viager II LLC. On March 2, 2009, Judge Louis Stanton modified an existing freeze order to surrender assets Madoff owns: his securities firm, real estate, artwork, and entertainment tickets, and granted a request by prosecutors that the existing freeze remain in place for the Manhattan apartment, and vacation homes in Montauk, New York, and Palm Beach, Florida. He has also agreed to surrender his interest in Primex Holdings LLC, a joint venture between Madoff Securities and several large brokerages, designed to replicate the auction process on the New York Stock Exchange. Madoff's April 14, 2009 opening day New York Mets tickets were sold for $7,500 on ebay. On April 13, 2009, a Connecticut judge dissolved the temporary asset freeze from March 30, 2009, and issued an order for Fairfield Greenwich Group executive Walter Noel to post property pledges of $10 million against his Greenwich home and $2 million against Jeffrey Tucker's. Noel agreed to the attachment on his house "with no findings, including no finding of liability or wrongdoing". Andres Piedrahita's assets continue to remain temporarily frozen because he was never served with the complaint. The principals are all involved in a lawsuit filed by the town of Fairfield, Connecticut, pension funds, which lost $42 million. The pension fund case is Retirement Program for Employees of the Town of Fairfield v. Madoff, FBT-CV-09-5023735-S, Superior Court of Connecticut (Bridgeport). Maxam Capital and other firms that allegedly fed Madoff's fund, which could allow Fairfield to recover up to $75 million were also part of the dissolution and terms. Professor John Coffee, of Columbia University Law School, said that much of Madoff's money may be in offshore funds. The SEC believed keeping the assets secret would prevent them from being seized by foreign regulators and foreign creditors. The Montreal Gazette reported on January 12, 2010 that there are unrecovered Madoff assets in Canada. In December 2010, Barbara Picower and others reached an agreement with Irving Picard to return 7.2 billion dollars from the estate of her deceased husband Jeffrey Picower to other investors in the fraud. In connection with the victim compensation process, on December 14 and 17, 2012, the Government filed motions requesting that the Court find restitution to be impracticable, thereby permitting the Government to distribute to victims the more than $2.35 billion forfeited to date as part of its investigation through the remission process, in accordance with Department of Justice regulations. Richard C. Breeden was retained to serve as Special Master on behalf of the Department of Justice to administer the process of compensating the victims through the Madoff Victim Fund. On February 4, 2009, the U.S. Bankruptcy Court in Manhattan released a 162-page client list with at least 13,500 different accounts, but without listing the amounts invested. Individual investors who invested through Fairfield Greenwich Group, Ascot Partners, and Chais Investments were not included on the list. Clients included banks, hedge funds, charities, universities, and wealthy individuals who have disclosed about $41 billion invested with Bernard L. Madoff Investment Securities LLC, according to a Bloomberg News tally, which may include double counting of investors in feeder funds. Although Madoff filed a report with the SEC in 2008 stating that his advisory business had only 11–25 clients and about $17.1 billion in assets, thousands of investors have reported losses, and Madoff estimated the fund's assets at $50 billion. Other notable clients included former Salomon Brothers economist Henry Kaufman, Steven Spielberg, Jeffrey Katzenberg, actors Kevin Bacon, Kyra Sedgwick, John Malkovich, and Zsa Zsa Gabor, Mortimer Zuckerman, Baseball Hall of Fame pitcher Sandy Koufax, the Wilpon family (owners of the New York Mets), broadcaster Larry King and World Trade Center developer Larry Silverstein. The Elie Wiesel Foundation for Humanity lost $15.2 million, and Wiesel and his wife, Marion, lost their life savings. The potential losses of these eight investors total $21.32 billion. The feeder fund Thema International Fund as of November 30, 2008 had a then-purported net asset value invested in the fund of $1.1 billion. Twenty-three investors with potential losses of $500,000 to $100 million were also listed, with a total potential loss of $540 million. The grand total potential loss in The Wall Street Journal table is $26.9 billion. Some investors have amended their initial estimates of losses to include only their original investment, since the profits Madoff reported were most likely fraudulent. Yeshiva University, for instance, said its actual incurred loss was its invested $14.5 million, not the $110 million initially estimated, which included falsified profits reported to the university by Madoff. It is estimated the potential tax penalties for foundations invested with Madoff are $1 billion. Although foundations are exempt from federal income taxes, they are subject to an excise tax, for failing to vet Madoff's proposed investments properly, to heed red flags, or to diversify prudently. Penalties may range from 10% of the amount invested during a tax year, to 25% if they fail to try to recover the funds. The foundation's officers, directors, and trustees face up to a 15% penalty, with up to $20,000 fines for individual managers, per investment. Criminal charges against five directors will proceed against Swiss wealth manager Aurelia Finance, which lost an alleged $800 million of client money. The directors' assets have been frozen. Clients primarily located in South America who invested with Madoff through the Spanish bank Grupo Santander, filed a class action against Santander in Miami. Santander proposed a settlement that would give the clients $2 billion worth of preferred stock in Santander based on each client's original investment. The shares pay a 2% dividend. Seventy percent of the Madoff/Santander investors accepted the offer. On May 8, 2009, a lawsuit against UBP was filed on behalf of New York investor Andrea Barron by law firm Bernstein Litowitz Berger & Grossman LLP in the U.S. District Court in Manhattan. Despite being a victim of Bernard Madoff's fraud, the bank offered in March 2009 to compensate eligible investors 50 percent of the money they initially invested with Madoff. On December 6, 2010, Union Bancaire Privée announced it had reached a settlement with the trustee for Madoff Investment Securities. UBP sidestepped the suit when it agreed to pay as much as $500 million to resolve Bernard Madoff trustee's claims. UBP was the first bank to settle Madoff trustee's claim. With this settlement, the Trustee agreed to discharge his "clawback" claims against UBP, its affiliates and clients. Bank Medici is an Austrian bank founded by Sonja Kohn, who met Madoff in 1985 while living in New York. Ninety percent of the bank's income was generated from Madoff investments. In December 2008, Medici reported that two of its funds—Herald USA Fund and Herald Luxemburg Fund—were exposed to Madoff losses. On January 2, 2009, FMA, the Austria banking regulator, took control of Bank Medici and appointed a supervisor to control the bank. Bank Medici, and its Austrian banking license is now for sale and has been sued by its customers both in the U.S. and in Austria. The Vienna State Prosecutor has launched a criminal investigation of Bank Medici and Kohn, who had invested an estimated $2.1 billion with Madoff. On May 28, 2009, Bank Medici lost its Austrian banking license. Kohn and the bank are under investigation. In April 2010, Connecticut Attorney General Richard Blumenthal sued the Westport National Bank and Robert L. Silverman for "effectively aiding and abetting" Madoff's fraud. The suit seeks recovery of $16.2 million, including the fees that the bank collected as custodian of customers' holding in Madoff investments. Silverman's 240 clients invested about $10 million with Madoff using the bank as the custodian. The bank denies any wrongdoing. The Picower Foundation, created in 2002, was one of the nation's leading philanthropies that supported groups such as the Picower Institute for Learning and Memory at the Massachusetts Institute of Technology, Human Rights First, the New York Public Library and the Children's Health Fund. It is listed as the 71st-largest in the nation by the Council on Foundations. The foundation reportedly invested $1 billion with Madoff. Jeffry Picower has been a friend of Bernard Madoff for 30 years. The Picower Foundation, along with other smaller charities who invested with Madoff, announced in December 2008 that they would be closing. In June 2012, Madoff's brother Peter was "expected to appear in Federal District Court in Manhattan and admit to, among other things, falsifying records, making false statements to securities regulators and obstructing the work of the Internal Revenue Service. He had [reportedly] agreed to a prison term of 10 years." On December 23, 2008, one of the founders of Access International Advisors LLC, René-Thierry Magon de la Villehuchet, was found dead in his company office on Madison Avenue in New York City. His left wrist was slit and de la Villehuchet had taken sleeping pills, in what appeared to be a suicide. He lived in New Rochelle, New York and came from a prominent French family. Although no suicide note was found at the scene, his brother Bertrand in France received a note shortly after his death in which René-Thierry expressed remorse and a feeling of responsibility for the loss of his investors' money. The FBI and SEC do not believe de la Villehuchet was involved in the fraud. Harry Markopolos said he had met with de La Villehuchet several years before, and had warned him that Madoff might have been breaking the law. In 2002, Access invested about 45% of its $1.2 billion under management with Madoff. By 2008, Access managed $3 billion and raised its proportion of funds invested with Madoff to about 75%. De la Villehuchet had also invested all of his wealth and 20% of his brother's, Bertrand, with Madoff. Bertrand said that René-Thierry did not know Madoff but the connection was through René-Thierry's partner in AIA, French banker, Patrick Littaye. On February 10, 2009, highly decorated British soldier William Foxton, OBE, 65, shot himself in a park in Southampton, England, having lost all of his family's savings. He had invested in the Herald USA Fund and Herald Luxembourg Fund, feeder funds for Madoff from Bank Medici in Austria. Madoff's elder son, Mark Madoff, was found dead on December 11, 2010, two years to the day after his father turned himself in. He was found hanged inside his New York apartment in an apparent suicide, but authorities said he left no suicide note. Mark had unsuccessfully sought a Wall Street trading job after the scandal broke, and it was reported that he was distraught over the possibility of criminal charges, as federal prosecutors were making criminal tax-fraud probes. Among the many Madoff family members being sued by the court-appointed trustee Irving Picard were Mark's two children. In his lawsuit, Picard stated that Mark and other Madoff family members improperly earned tens of millions of dollars, through "fictitious and backdated transactions" investment transactions, and falsely documented loans to buy real estate that weren't repaid. Picard also argued that Mark was in a position to recognize the fraud of his father's firm, as Mark was a co-director of trading, was the designated head of the firm in his father's absence, and held several securities licenses—series 7, 24 and 55 with the Financial Industry Regulatory Authority. However, he worked in a division of Madoff's company distinct from the one involved with Madoff's fraud, which has not been accused of any wrongdoing. Charles Murphy, a hedge fund executive with Fairfield Greenwich Group that invested more than $7 billion with Madoff, including nearly $50 million of personal wealth, leapt from the 24th floor of the Sofitel New York Hotel on March 27, 2017. Following the Madoff investment scandal, the SEC's inspector general conducted an internal investigation into the agency's failures to uncover the scheme despite a series of red flags and tips. In September 2009, the SEC released a 477-page report on how the SEC missed these red flags and identifies repeated opportunities for SEC examiners to find the fraud and how ineffective their efforts were. In response to the recommendations in that report, eight SEC employees were disciplined; none were fired. On January 7, 2014, Forbes magazine and other news outlets reported that the bank JPMorgan Chase, "where Madoff kept the bank account at the center of his fraud", would pay a settlement of $1.7 billion. This resolved any potential criminal case against the bank arising from the Madoff scandal. JPMorgan entered into a deferred prosecution agreement with federal prosecutors to resolve two felony charges of violating the Bank Secrecy Act. The bank admitted to failing to file a "Suspicious Activity Report" after red flags about Madoff were raised, which, prosecutors alleged, did not have adequate anti-money laundering compliance procedures in place. In November 2015, Picard announced that $1.42 billion has been authorized by U.S. judges to be given to victims of the scheme. Individual distributions would range from $1,287 to $200.4 million according to Picard. Bloomberg Business News reported in 2016 that investors of approximately $2.5 billion of funds had made no effort to claim their lost funds. Analysts suspect that these parties have remained silent because their investments were from illegal activities such as drug dealing or tax evasion, or because they had civil liabilities in the United States and did not wish to subject themselves to the jurisdiction of the U.S. courts. In September 2017 in a case before the Irish High Court, Thema International Fund agreed to pay $687 million to resolve a trustee lawsuit brought on behalf of the fraud victims resulting from Madoff's frauds. ^ David Glovin (February 11, 2009). "Madoff Prosecutors Get 30 More Days for Indictment". Bloomberg L.P. Retrieved February 11, 2009. ^ a b Bray, Chad (March 12, 2009). "Madoff Pleads Guilty to Massive Fraud". The Wall Street Journal. Dow Jones, Inc. Retrieved October 16, 2015. ^ "Biggest Fraud in History $50 billion Madoff Ponzi Scheme". December 13, 2008. ^ Randall, David (December 14, 2008). "Rich investors 'wiped out' by Wall Street fraud". The Independent. London. Retrieved December 17, 2008. ^ Hipwell, Deirdre (December 12, 2008). "Wall Street legend Bernard Madoff arrested over '$50 billion Ponzi scheme'". Times Online. London: Times Newspapers Ltd. Retrieved December 13, 2008. ^ Prosecutors say half of Bernie Madoff's investors lost nothing in Ponzi scheme, a September 23, 2009 article from the New York Daily News. Retrieved September 23, 2009. ^ a b c d e f g Markopolos, Harry (2010). No One Would Listen: A True Financial Thriller. John Wiley & Sons. ISBN 978-0-470-55373-2. ^ a b c Caruso, David (December 18, 2008). "Madoff Investigators Look for Partners". AOL. Associated Press. Archived from the original on September 22, 2018. Retrieved December 23, 2008. ^ a b c d Lieberman, David; Pallavi Gogoi; Theresa Howard; Kevin McCoy; Matt Krantz (December 15, 2008). "Investors remain amazed over Madoff's sudden downfall". USA Today. Retrieved December 24, 2008. ^ a b c d e Appelbaum, Binyamin; David S. Hilzenrath; Amit R. Paley (December 13, 2008). "'All Just One Big Lie'". The Washington Post. Washington Post Company. p. D01. Retrieved December 12, 2008. ^ "Madoff Wall Street fraud threatens Jewish philanthropy". Retrieved December 13, 2008. ^ Henriques (December 13, 2008). "For Investors, Trust Lost, and Money Too". The New York Times. Retrieved December 13, 2008. ^ "The Madoff files: Bernie's billions". London: The Independent. January 29, 2009. Retrieved April 26, 2009. ^ Bloomberg (February 1, 2009). "Madoff's tactics date to 1960s, when father-in-law was recruiter | Business Features | Jerusalem Post". Jpost.com. Archived from the original on June 15, 2011. Retrieved April 26, 2009. ^ a b c d e f de la Merced, Michael J. (December 24, 2008). "Effort Under Way to Sell Madoff Unit". The New York Times. Retrieved December 24, 2008. ^ Weiner, Eric J. (2005). What Goes Up: The Uncensored History of Modern Wall Street as Told by the Bankers, Brokers, CEOs, and Scoundrels who Made it Happen. Little, Brown and Company. pp. 188–192. ISBN 0-316-92966-2. Retrieved March 13, 2009. ^ a b c d e Smith, Randall (December 16, 1992). "Wall Street Mystery Features a Big Board Rival". The Wall Street Journal. ^ Feuer, Alan; Haughney, Christine (December 12, 2008). "Standing Accused: A Pillar of Finance and Charity". The New York Times. Retrieved October 27, 2011. ^ Probe Eyes Role of Aide to Madoff, Accountant. The Wall Street Journal, December 23, 2008. ^ Kolker, Carlyn; Tiffany Kary; Saijel Kishan (December 23, 2008). "Madoff Victims May Have to Return Profits, Principal". Bloomberg News. Retrieved December 24, 2008. ^ a b c "Plea Allocution of Bernard Madoff (U.S. v. Bernard Madoff)" (PDF). The Wall Street Journal. March 12, 2009. Retrieved March 12, 2009. ^ Harris, Larry (2003). Trading and Exchanges: Market Microstructure for Practitioners. Oxford University Press. p. 290. ISBN 0-19-514470-8. Retrieved March 13, 2009. ^ Henriques, Diana B.; Alex Berenson (December 14, 2008). "The 17th Floor, Where Wealth Went to Vanish". The New York Times. Retrieved December 23, 2008. ^ Dovkants, Keith; Alex Berenson (December 16, 2008). "Revealed: Magic Madoff's family 'piggy bank' in the heart of Mayfair". Evening Standard. Retrieved December 25, 2008. ^ a b Creswell, Julie (January 24, 2009). "The Talented Mr. Madoff". The New York Times. Retrieved January 25, 2009. ^ a b c d e f Moyer, Liz (December 23, 2008). "Could SEC Have Stopped Madoff Scam In 1992?". Forbes. Archived from the original on February 1, 2009. Retrieved December 24, 2008. ^ a b Berenson, Alex; Henriques, Diana B. (December 13, 2008). "Look at Wall St. Wizard Finds Magic Had Skeptics". The New York Times. Retrieved December 15, 2008. ^ a b c Arvedlund, Erin E. (May 7, 2001). "Don't Ask, Don't Tell – Bernie Madoff is so secretive, he even asks investors to keep mum" (PDF). Barron's. Retrieved August 12, 2009. ^ Zuckoff, Mitchell (December 29, 2008). "Were charities part of Madoff's secret formula? – Dec. 29, 2008". Money.cnn.com. Retrieved April 26, 2009. ^ a b "Tough task ahead to find Madoff money, co-schemers". Associated Press. March 13, 2009. Retrieved March 13, 2009. ^ Safer, Morley (September 27, 2009). "The Madoff Scam: Meet The Liquidator". 60 Minutes. CBS News. pp. 1–4. Retrieved September 28, 2009. ^ Janet Tavakoli (March 9, 2009). "Madoff Deserves Lots of Company". ^ "Investor Furor Over '50B Scam'". New York Post. December 14, 2008. Archived from the original on December 17, 2008. Retrieved December 17, 2008. ^ Brown, Ian (December 31, 2016). "A look inside Palm Beach, where wealthy Canadians are one degree of separation from Donald Trump". The Globe and Mail. ^ a b Henriques, Diana B. (December 20, 2008). "Madoff Scheme Kept Rippling Outward, Across Borders". The New York Times. Retrieved December 22, 2008. ^ Biggs, Barton (January 3, 2009). "The Affinity Ponzi Scheme". Newsweek. Retrieved March 9, 2009. ^ a b Chernoff (December 26, 2008). "What drove Bernie Madoff". CNN. Retrieved December 26, 2008. ^ a b Schwartz, Nelson D. (December 24, 2008). "Madoff Dealings Tarnish a Private Swiss Bank". The New York Times. Retrieved December 23, 2008. ^ " "Marketing Advisory: Madoff Knew His Target Market" Marketing Doctor Blog. December 18, 2008. ^ ALEX BERENSON; DIANA B. HENRIQUES (December 12, 2008). "Look at Wall St. Wizard Finds Magic Had Skeptics". The New York Times. Retrieved March 9, 2009. ^ "Prominent Trader Accused of Defrauding Clients", The New York Times December 12, 2008. ^ Sender, Henry (December 21, 2008). "Madoff had 'perceived edge' in the markets". Financial Times. Retrieved December 25, 2008. ^ Barlyn, Suzanne (December 23, 2008). "Madoff Case Raises Compliance Questions". The Wall Street Journal. Retrieved March 1, 2008. ^ Williamson, Elizabeth; Kara Scannell (December 18, 2008). "Family Filled Posts at Industry Groups". The Wall Street Journal. Retrieved March 1, 2009. ^ a b Lerer, Lisa (December 18, 2008). "Peter Madoff resigns". Politico. Retrieved March 1, 2009. ^ Javers, Eamon; Lisa Lerer (December 16, 2008). "Madoff bought influence in Washington". Politico. Retrieved March 1, 2009. ^ Madoff, Shana. "San Francisco Topical Breakfast". Compliance and Legal Division of the Securities Industry and Financial Markets Association. Archived from the original on September 3, 2014. Retrieved March 1, 2009. ^ Investigation of Failure of the SEC to Uncover Bernard Madoff's Ponzi Scheme ... Retrieved March 1, 2013. ^ "SEC Official Married into Madoff Family – ABC News". Abcnews.go.com. December 16, 2008. Retrieved April 26, 2009. ^ a b c d e f g h i j Scannell, Kara (January 5, 2009). "Madoff Chasers Dug for Years, to No Avail". The Wall Street Journal. Retrieved January 5, 2009. ^ a b c Johnson, Harriet (March 8, 2009). "Sun Sentinel exclusive: Former Madoff associate Michael Bienes breaks his silence – South Florida Sun-Sentinel.com". Sun-sentinel.com. Retrieved April 5, 2016. ^ Healy (December 13, 2008). "Boston donors bilked out of millions". Boston Globe. Retrieved March 13, 2009. ^ a b "The Madoff files: Bernie's billions". London: The Independent. January 29, 2009. Retrieved April 26, 2009. ^ a b "Markopolos Testimony" (PDF). The Wall Street Journal. ^ Press, Associated (February 3, 2009). "Man who warned about Bernard Madoff to testify – BostonHerald.com". BostonHerald.com<!. Retrieved April 26, 2009. ^ a b Serchuk, David (December 20, 2008). "Love, Madoff And The SEC". Forbes. Retrieved December 24, 2008. ^ "The Man Who Figured Out Madoff's Scheme". CBS News. February 27, 2009. ^ Markopolos, Harry (November 7, 2005). "The World's Largest Hedge Fund is a Fraud". Wall Street Journal Online. Archived from the original (PDF) on August 18, 2009. Retrieved December 22, 2008. ^ E&P Staff (February 4, 2009). "Whistleblower Claims He Tipped 'WSJ' to Madoff Fraud, Paper Failed to Act". ^ a b Chew, Robert (February 4, 2009). "A Madoff Whistle-Blower Tells His Story". TIME. Retrieved April 26, 2009. ^ "Lawrence R. Velvel: Investing with Madoff". Counterpunch.org. Retrieved April 26, 2009. ^ "Madoff's Brother Said to Audit Firm's Investments". Bloomberg. February 4, 2009. ^ Fitzgerald, Jim (December 18, 2008). "Madoff's financial empire audited by tiny firm: one guy". Seattle Times. Associated Press. Retrieved December 18, 2008. ^ Voreacos, David (December 16, 2008). "New York Prosecutor Drops Madoff Auditor Probe; Defers to U.S". Bloomberg News. Retrieved December 24, 2008. ^ Kouwe, Zachery (December 15, 2008). Andrew Ross Sorkin (ed.). "A Look at Madoff Trading Records". Deal Book. The New York Times. Retrieved December 22, 2008. ^ "Wall Street Titan May Have Fooled Investors for Years". CNBC. Archived from the original on June 11, 2011. Retrieved December 13, 2008. ^ Zuckerman (December 13, 2008). "Fees, Even Returns and Auditor All Raised Flags". The Wall Street Journal. ^ David B. Caruso (December 13, 2008). "A trusted man, $50B, a "giant Ponzi scheme"". The Seattle Times. Associated Press. Retrieved March 9, 2009. ^ Hamilton (December 13, 2008). "Madoff's reliable returns aroused doubts". LA Times. Retrieved December 13, 2008. ^ a b c d Henriques, Diana (2011). The Wizard of Lies. Times Books. ISBN 0805091343. ^ a b c d Ross, Brian (2015). The Madoff Chronicles. Kingswell. ISBN 9781484781401. ^ McCool, Grant (February 27, 2009). "Receiver says Madoff moved $164 million from UK firm to U.S. | Reuters". Uk.reuters.com. Retrieved April 26, 2009. ^ a b Bray, Chad (February 25, 2009). "Investor's Suit Is Dismissed – WSJ.com". Online.wsj.com. Retrieved April 26, 2009. ^ "Madoff Sought, Got Cash in Days Before Arrest". SmartMoney. January 9, 2009. Retrieved January 29, 2009. ^ a b David Glovin, David Voreacos and David Scheer (February 24, 2009). "Madoff Must Have Had Help, Lawyers Say, Citing Trustee Report". Bloomberg.com. Retrieved April 28, 2011. ^ a b Henriques, Diana B. (June 22, 2009). "Brokerage Firm and 4 Others Sued in Madoff Case". The New York Times. Retrieved June 22, 2009. ^ Jonathan Stempel (August 21, 2009). "Madoff friend wants SEC, trustee charges dismissed". Reuters. Retrieved March 16, 2010. ^ Standora, Leo (May 2, 2009). "Los Angeles investment manager Stanley Chais sued for funneling cash to Bernie Madoff fund". New York Daily News. ^ Pfeifer, Stuart (September 23, 2009). "Financial advisor Stanley Chais sued in Bernie Madoff scheme – Los Angeles Times". Latimes.com. Retrieved March 16, 2010. ^ a b Efrati, Amir (May 18, 2009). "Madoff Victims Investigated – WSJ.com". Online.wsj.com. Retrieved March 16, 2010. ^ Bray, Chad (July 18, 2009). "Madoff Ex-Auditor Friehling Enters a Plea of Not Guilty – WSJ.com". Online.wsj.com. Retrieved March 16, 2010. ^ "Ruth Madoff Asks to Keep Her Fur Coat as U.S. Marshals Seize Penthouse – Local News | News Articles | National News | US News". FOXNews.com. July 2, 2009. Retrieved March 16, 2010. ^ Gearty, Robert; Standora, Leo (August 4, 2009). "Bernie Madoff's wife, Ruth, agrees to account for monthly spending". New York: Nydailynews.com. Retrieved March 16, 2010. ^ E-mail This (July 29, 2009). "Trustee Sues Ruth Madoff for $44.8 Million – DealBook Blog – NYTimes.com". Dealbook.blogs.nytimes.com. Retrieved March 16, 2010. ^ Fitzgerald, Patrick (July 30, 2009). "Trustee Sues Ruth Madoff for More Than $44 Million – WSJ.com". Online.wsj.com. Retrieved March 16, 2010. ^ "Lawsuit Against Ruth Madoff (Irving Picard)". Scribd.com. March 1, 2009. Retrieved March 16, 2010. ^ Groendahl, Boris (February 12, 2009). "Medici's Kohn says did not get Madoff payments | Markets | Markets News | Reuters". Reuters. Retrieved April 26, 2009. ^ "Galvin seeks to shut down firm with Madoff ties – Daily Business Update – The Boston Globe". Boston.com. February 11, 2009. Archived from the original on February 14, 2009. Retrieved April 26, 2009. ^ "Madoff's Wife Got $2 Million from UK Unit – Financials * Europe * News * Story". CNBC.com. March 27, 2009. Retrieved April 26, 2009. ^ "Madoff Fraud Charges Could Be Filed in U.K. This Year (Update4)". Bloomberg.com. March 27, 2009. Retrieved April 26, 2009. ^ "The Loneliest Woman in New York" by Lynnley Browning, The New York Times, June 12, 2009 (6/14/09 p. ST1 of the NY ed.). Retrieved 6/14/09. ^ a b "Madoff to Forfeit $170 Billion In Assets Ahead of Sentencing". washingtonpost.com. June 27, 2009. Retrieved March 16, 2010. ^ a b c d Efrati, Amir (June 28, 2009). "Madoff's Wife Cedes Asset Claim – WSJ.com". Online.wsj.com. Retrieved March 16, 2010. ^ Mike Greenlar / The Post Standard. "How warning signs eluded Bernard Madoff's man in Syracuse". Syracuse.com. Retrieved April 26, 2009. ^ Efrati, Amir (April 1, 2009). "Judge Freezes Assets of Madoff's Family – WSJ.com". Online.wsj.com. Retrieved April 26, 2009. ^ Margolick, David (July 2009). "The Madoff Chronicles, Part III: Did the Sons Know". Vanity Fair. Retrieved June 25, 2009. ^ Lucchetti, Aaron (October 3, 2009). "Madoff Trustee Sues Swindler's Family – WSJ.com". Online.wsj.com. Retrieved March 16, 2010. ^ "Baker & Hostetler LLP" (PDF). Abcnews.go.com. Retrieved October 7, 2012. ^ Chad Bray (March 17, 2010). "Madoff Sons: We're Victims". The Wall Street Journal. ^ Larry Neumeister (December 12, 2010). "Madoff son's suicide followed battle with trustee". Associated Press. Retrieved December 13, 2010. ^ Henriques, Diana B. (September 3, 2014). "Andrew Madoff, Who Told of His Father's Swindle, Dies at 48". The New York Times. ISSN 0362-4331. Retrieved December 11, 2018. ^ "United States v. Frank DiPascali, Jr" (PDF). Abcnews.go.com. Retrieved October 7, 2012. ^ "Frank DiPascali Pleads Guilty, Bernard Madoff's Accomplice – ABC News". Abcnews.go.com. August 11, 2009. Retrieved March 16, 2010. ^ "SEC CHARGES KEY MADOFF LIEUTENANT FOR OPERATING AND CONCEALING FRAUD THROUGH BOGUS TRADES AND DOCUMENTS" (PDF). The Wall Street Journal. ^ Bray, Chad (August 12, 2009). "'All Fake': Key Madoff Executive Admits Guilt – WSJ.com". Online.wsj.com. Retrieved March 16, 2010. ^ Yang, Stephanie (May 11, 2015). "Former Madoff Aide Frank DiPascali Dies at Age 58 of Lung Cancer". Wall Street Journal. ^ "Bernie Madoff: Why Is Bernie's Controller, Enrica Cotellessa-Pitz, Getting A Pass In The Press? | Mrs Panstreppon's Blog". Tpmcafe.talkingpointsmemo.com. May 11, 2009. Archived from the original on July 5, 2009. Retrieved March 16, 2010. ^ "Securities: Fairfield Greenwich". Sec.state.ma.us. April 1, 2009. Retrieved April 26, 2009. ^ Frank, Robert; Lauricella, Tom (April 2, 2009). "Madoff Feeder Is Charged in Fraud – WSJ.com". Online.wsj.com. Retrieved April 26, 2009. ^ Healy, Beth (August 14, 2009). "Galvin won't settle Madoff case – The Boston Globe". Boston.com. Retrieved March 16, 2010. ^ Svea Herbst-Bayliss (August 14, 2009). "Mass. regulator will not settle Madoff feeder suit". Reuters. Retrieved March 16, 2010. ^ Henriques, Diana B. (May 19, 2009). "Trustee Sues Hedge Funds Over Losses to Madoff". The New York Times. Retrieved May 12, 2010. ^ Jones, Ashby (May 19, 2009). "Picard's Latest: A Huge Lawsuit Against Fairfield Greenwich – Law Blog – WSJ". Blogs.wsj.com. Retrieved March 16, 2010. ^ "Merkin Complaint" (PDF). The Wall Street Journal. ^ Graybow, Martha (April 6, 2009). "Fund operator Merkin charged with civil fraud". Reuters. ^ "Merkin Exhibit One" (PDF). The Wall Street Journal. ^ "Merkin Exhibit Two" (PDF). The Wall Street Journal. ^ "Merkin Exhibit Three" (PDF). The Wall Street Journal. ^ "Madoff pal Jeffry Picower laid to rest on Long Island | Jose Lambiet's". Page2live.com. Archived from the original on November 1, 2009. Retrieved March 16, 2010. ^ "UniCredit wins dismissal in Madoff case". ft.com. December 15, 2008. Retrieved February 26, 2009. ^ "Tremont Group Funds Invested $3.3 Billion With Madoff (Update1)". Bloomberg.com. December 15, 2008. Retrieved April 26, 2009. ^ Randall, David (March 31, 2009). "Judge Freezes Madoff Assets". Forbes.com. Archived from the original on January 23, 2013. Retrieved April 26, 2009. ^ "Madoff's Director of Operations Arrested". Traders Magazine Online News. February 25, 2010. Retrieved February 25, 2010. ^ "Press Release: Manhattan U.S. Attorney Charges Daniel Bonventre, Former Director Of Operations For Bernard L. Madoff Investment Securities, Llc, With Conspiracy, Securities Fraud, And Tax Crimes" (PDF). US DOJ United States Attorney Southern District of New York. February 25, 2010. Archived from the original (PDF) on March 2, 2010. Retrieved March 4, 2010. ^ "FBI — Manhattan U.S. Attorney Files Additional Charges Against Former Employees of Bernard L. Madoff Investment Securities LLC". Fbi.gov. Retrieved October 7, 2012. ^ "Madoff Trustee Picard May Take Five Years to Pay Back Investors – Bloomberg.com". Bloomberg.com<!. January 21, 2009. Retrieved April 26, 2009. ^ McCool, Grant (January 22, 2009). "Fairfield fund wins order in Madoff-related suit". Reuters. ^ E-mail This (June 23, 2009). "Madoff Lawyers Seek Leniency in Sentencing – DealBook Blog – NYTimes.com". Dealbook.blogs.nytimes.com. Retrieved March 16, 2010. ^ Glovin, Dan; Bradley Keoun (December 11, 2008). "Madoff Charged in $50 Billion Fraud at Investment Advisory Firm". Bloomberg News. Retrieved December 11, 2008. ^ a b c d e "The United States Department of Justice – United States Attorney's Office". Usdoj.gov. Archived from the original on August 22, 2007. Retrieved April 26, 2009. ^ a b Henriques, Diana; Zachery Kouwe (December 11, 2008). "Prominent Trader Accused of Defrauding Clients". The New York Times. Retrieved December 11, 2008. ^ Efrati, Amir; Aaron Lucchetti; Tom Lauricella (December 23, 2008). "Probe Eyes Audit Files, Role of Aide To Madoff". The Wall Street Journal. Dow Jones. Retrieved December 23, 2008. ^ "Madoff faces life in prison on 11 criminal charges". Reuters. March 11, 2009. ^ "Madoff Securities Employees Sue Madoff Sons, Allege Fraud". The Wall Street Journal. June 16, 2009. Archived from the original on June 20, 2009. Retrieved July 27, 2009. ^ a b Neumeister, Larry (December 11, 2008). "Ex-Nasdaq chair arrested on fraud charge". Associated Press. Yahoo-Finance document http://biz.yahoo.com/ap/081211/wall_street_arrest.html accessed December 11, 2008 has expired. ^ Efrati, Amir; Lauricella, Tom; Searcey, Dionne (December 11, 2008). "Top Broker Accused of Fraud; Madoff, Money Manager for the Wealthy, Said to Have Run '$50 Billion Ponzi Scheme'". The Wall Street Journal. Retrieved December 11, 2008. ^ Honan, Edith; Dan Wilchins (December 12, 2008). "Former Nasdaq chair arrested over alleged £33 billion fraud". International Herald Tribune. Retrieved December 12, 2008. ^ a b Rush, George; Thomas Zambito; Phyllis Furman; Greg B. Smith (December 18, 2008). "Bernard Madoff Housebound After Failing to Get Enough Co-signers for Bail Bond in $50B Ponzi Scheme". New York Daily News. Retrieved December 26, 2008. ^ a b Zambito, Thomas; Corky Siemaszko (December 20, 2008). "Feds confine Bernie Madoff to his $7 million penthouse until trial". New York Daily News. Retrieved December 26, 2008. ^ "SIPC page 7, VII. U.S. Securities and Exchange Commission" (PDF). Retrieved March 1, 2013. ^ Glovin, David (January 6, 2009). "Madoff Sons Reported Jewelry Violations to U.S., Lawyer Says". Bloomberg.com. Retrieved January 6, 2009. ^ a b Berenson, Alex (January 6, 2009). "Bid to Revoke Madoff's Bail Cites His Gifts". The New York Times. Retrieved January 6, 2009. ^ Henrique, Diana (January 12, 2009). "Judge Rules Madoff Can Remain Free on Bail". The New York Times. Retrieved January 12, 2009. ^ "Criminal Information (U.S. v. Bernard Madoff". FindLaw. March 10, 2009. Retrieved March 10, 2009. ^ a b "U.S. Department of Justice: United States v. Bernard L. Madoff" (PDF). Usdoj.gov. Retrieved October 16, 2015. ^ Lauricella, Tom (March 12, 2009). "Madoff Used U.K. Office in Cash Ploy, Filing Says – WSJ.com". Online.wsj.com. Retrieved April 26, 2009. ^ "Madoff Lawyer Ira Sorkin Invested $18,860 With Madoff (Update2) – Bloomberg.com". Bloomberg.com. March 10, 2009. Retrieved April 26, 2009. ^ "Madoff to appeal bail, net worth revealed | U.S". Reuters. March 13, 2009. Retrieved April 26, 2009. ^ "United States Court of Appeals for the Second Circuit: United States v. Bernard L. Madoff" (PDF). Usdoj.gov. Retrieved October 7, 2012. ^ Zambito, Thomas; Connor, Tracy (March 17, 2009). "Bernard Madoff's sons, Andrew and Mark, latest targets of feds' efforts to seize ill-gotten loot". New York: Nydailynews.com. Retrieved April 26, 2009. ^ "Bernard Madoff's Bid for Freedom Denied by U.S. Court (Update5)". Bloomberg.com. March 20, 2009. Archived from the original on March 12, 2010. Retrieved April 26, 2009. ^ Zambito, Thomas; Martinez, Jose; Siemaszko, Corky (June 29, 2009). "Bye, Bye Bernie: Ponzi king Madoff sentenced to 150 years". New York: Nydailynews.com. Retrieved March 16, 2010. ^ "Madoff Lacks What Skilling, Ebbers, Fastow Had: Ann Woolner". Bloomberg.com. July 1, 2009. Retrieved March 16, 2010. ^ Frank, Robert (June 30, 2009). "Bernard Madoff, Convicted Ponzi-Scheme Operator, Sentenced to 150 Years – WSJ.com". Online.wsj.com. Retrieved March 16, 2010. ^ Murakami Tse, Tomoeh (June 30, 2009). "Madoff Sentenced to 150 Years Calling Ponzi Scheme 'Evil,' Judge Orders Maximum Term". Washington Post. Retrieved September 24, 2009. ^ "Madoff's Failure to Name Accomplices Cripples His Leniency Bid". Bloomberg.com. June 26, 2009. Retrieved March 16, 2010. ^ "Bernard Madoff gets 150 years behind bars for fraud scheme". CBC News. June 29, 2009. Archived from the original on July 2, 2009. Retrieved June 29, 2009. ^ Perez, Evan; Bray, Chad (July 13, 2009). "Madoff is Moved to a Prison in Butner N.C". The Wall Street Journal. ^ "Madoff Finance" (PDF). Archived from the original (PDF) on March 17, 2009. Retrieved March 16, 2009. ^ "Prosecutors Seek to Claim More Madoff Assets — DealBook Blog — NYTimes.com". Dealbook.blogs.nytimes.com. March 17, 2009. Retrieved April 26, 2009. ^ "Madoff Prosecutors Seek to Take Businesses, Loans (Update1)". Bloomberg.com. March 17, 2009. Retrieved April 26, 2009. ^ "Ruth Madoff Says Her $62 Million 'Unrelated' to Fraud (Update2) – Bloomberg.com". Bloomberg.com<!. March 2, 2009. Retrieved April 26, 2009. ^ Goldsmith, Samuel (April 12, 2009). "Now that's a decent return! Madoff's opening day Mets tickets sell for $7,500 on eBay". New York: Nydailynews.com. Retrieved April 26, 2009. ^ "Minuteman News Center". Zwire.com. Archived from the original on July 6, 2009. Retrieved March 16, 2010. ^ "Madoff-Linked Asset Freeze Lifted in Connecticut Suit (Update1)". Bloomberg.com. April 13, 2009. Retrieved March 16, 2010. ^ "Judge freezes assets of Madoff sons, executives". Reuters. March 31, 2009. Retrieved March 16, 2010. ^ "Town of Fairfield suit against NEPC and KPMG". Scribd.com. Retrieved March 16, 2010. ^ "Fairfield gets freeze on Madoff assets". Wtnh.com. Retrieved April 26, 2009. ^ "ABC News: Madoff Set to Disclose List of Holdings". Abcnews.go.com. December 17, 2008. Retrieved April 26, 2009. ^ Scheer, David (January 2, 2009). "Madoff's assets to be kept secret". Business.smh.com.au. Retrieved April 26, 2009. ^ Madoff trustee finds assets in Canada, Montreal Gazette, January 12, 2010. ^ "Picower estate returns $7.2 billion from Madoff scam | JTA – Jewish & Israel News". JTA. December 17, 2010. Archived from the original on September 26, 2012. Retrieved October 7, 2012. ^ Fleury, Michelle (February 19, 2009). "Business | Madoff victims count their losses". BBC News. Retrieved April 26, 2009. ^ "WSJ: Madoff Client List" (PDF). The Wall Street Journal. ^ Chew, Robert (February 5, 2009). "The Bernie Madoff Client List Is Made Public". TIME. Retrieved April 26, 2009. ^ "Madoff's Firm Owed $600 Million in Stock, SIPC Says (Update1) – Bloomberg.com". Bloomberg.com<!. January 27, 2009. Retrieved April 26, 2009. ^ "Banks face huge losses from $50B 'scam'". CNN. December 15, 2008. ^ Bennett, Chuck; Rosario, Frank (December 15, 2008). ""Zuckerman Sounds Off on Madoff", New York Daily News (December 14, 2008)". New York Post. ^ Strom, Stephanie (February 27, 2009). "Elie Wiesel Levels Scorn at Madoff". The New York Times. Retrieved May 12, 2010. ^ Jerome De Lavenere Lussan (2012). The Financial Times Guide to Investing in Funds: How to Select Investments, Assess Managers and Protect Your Wealth. FT Press. Retrieved February 9, 2013. ^ International Currency Review, Volume 34. 2008. Retrieved February 9, 2013. ^ Browning, Lynnley (February 12, 2009). "For Investing With Madoff, Private Foundations Could Face Tax Fines". The New York Times. Retrieved May 12, 2010. ^ "Swiss judge allows charges in Madoff losses case | Reuters". Uk.reuters.com. February 9, 2009. Retrieved April 26, 2009. ^ "Aurelia managers sought safety in Madoff: report | Reuters". Uk.reuters.com. April 28, 2009. Retrieved March 16, 2010. ^ Granby, Rachael (February 22, 2009). "Clients Lose Again with Santander's Madoff Compensation – Barron's". Barron's. Retrieved March 13, 2009. ^ Reuters (February 19, 2009). "70% of Santander Clients Take Madoff Settlement". The New York Times. Retrieved March 13, 2009. ^ "Barron v. Igolnikov et al". Justia.com. ^ "UBP Makes Offer to Madoff Victims". The New York Times. March 13, 2009. ^ McCool, Grant (December 6, 2010). "HSBC fights Madoff claim; new settlement reached". Reuters. ^ "Madoff Trustee Announces Approximately $500 Million Recovery Agreement With Swiss Bank Union Bancaire Privee". PR Newswire. December 6, 2010. ^ Espinoza, Javier (February 1, 2009). "Austria Takes Control Of Madoff-Tainted Bank". Forbes. Retrieved February 24, 2010. ^ "Austria: Madoff-Exposed Bank Medici Reportedly on Brink of Collapse, Class Action May Be in Works". Securities Docket. January 21, 2009. Retrieved March 13, 2009. ^ "Austria takes over bank hit by Madoff case". CNN. January 3, 2009. Retrieved March 13, 2009. ^ Groendahl, Boris (March 12, 2009). "Austria's Madoff-hit Bank Medici seeks buyers". Reuters. Retrieved March 13, 2009. ^ Blodget, Henry (March 1, 2009). "Madoff Feeder Bank Medici Probed Criminally In Vienna". Business Insider. Retrieved March 13, 2009. ^ Hansen, Flemming E. (May 28, 2009). "Madoff-Hit Bank Medici Loses License – WSJ.com". Online.wsj.com. Retrieved March 16, 2010. ^ Wayne, Leslie; Rashbaum, William K. (March 12, 2009). "Investigation Into Madoff Fraud Turns to a Small Circle of Accountants". The New York Times. Retrieved May 12, 2010. ^ "Was Madoff 'Victim' and Best Friend an Accomplice? – Page 1". The Daily Beast. Retrieved April 26, 2009. ^ Bray, Chad (April 20, 2010). "Connecticut Sues Madoff-Tied Adviser, Bank". The Wall Street Journal. p. C7. ^ Fabrikant, Geraldine (December 20, 2008). "Foundation That Relied On Madoff Fund Closes". New York Times. ^ Lattman, Peter, "Peter Madoff Expected to Plead Guilty", The New York Times, June 27, 2012. Retrieved June 27, 2012. ^ "Police: Madoff Investor Found Dead of Suicide" (text and audio). AP Newswire. 1010 WINS. Retrieved December 23, 2008. ^ a b Marino, Joe; Schapiro, Rich (December 25, 2008). "Bernie Madoff should rot with rats, victim's pal says". New York Daily News. Retrieved December 26, 2008. ^ Zuckerman, Gregory; Gauthier-Villars, David (February 3, 2009). "A Lonely Lament From a Whistle-Blower – WSJ.com". Online.wsj.com. Retrieved April 26, 2009. ^ "U.K.'s Prince Charles Targeted by Madoff Marketer, Witness Says – Bloomberg.com". Bloomberg.com<!. February 6, 2009. Retrieved April 26, 2009. ^ "Madoff Investor’s Suicide Leaves Questions" by Alex Berenson and Matthew Saltmarsh, The New York Times, 2009-01-02, p. B1 NY edition. ^ "Bernard Madoff fraud victim committed suicide to avoid bankruptcy shame". telegraph.co.uk. London. June 11, 2009. Retrieved June 28, 2009. ^ Thompson, Susan (February 12, 2009). "Bernard Madoff has 'blood on his hands' over William Foxton suicide". London: Business.timesonline.co.uk. Retrieved April 26, 2009. ^ Little (February 12, 2009). "Banking crisis killed my father". BBC. Retrieved February 13, 2009. ^ AFP (December 16, 2008). "Madoff : la banque autrichienne Medici impliquée avec 2,1 milliards de dollars". Romandie News (in French). Retrieved March 13, 2009. ^ Martha Graybow and Daniel Trotta. "Mark Madoff found hanged on anniversary of father Bernie's arrest". Vancouver Sun. Retrieved December 13, 2010. ^ Lucchetti, Aaron (December 14, 2010). "Madoff Won't Attend Son's Funeral". The Wall Street Journal. ^ "Investor burned by Madoff leaps to death from luxury hotel balcony". The New York Post. March 27, 2017. ^ Vardi, Nathan (January 7, 2014). "J P Morgan Chase pays $1.7 billion and settles Madoff related criminal case". Forbes. ^ Hiltzik, Michael (January 7, 2014). "The Madoff settlement is an enormous win for a guilty JPMorgan". Los Angeles Times. Retrieved January 8, 2014. ^ "Madoff investors to get over $1 billion in added recoveries". MarketWatch. Retrieved November 19, 2015. ^ "Madoff victims to recoup $1.42 billion in two payouts". Today Online. Retrieved November 19, 2015. ^ Erik Larson, "The Mystery Madoff Victims Who Left $2.5 Billion on the Table", Bloomberg Business News (March 4, 2016).